A marvelous transformation happens in Venice in the month of December when the tourist population declines to half of the normal August droves. Suddenly you’re able to stroll deserted quays and empty squares with hardly a thought of stumbling head first into tour groups from the cruise ships. In this time of year it’s mostly Venice for the Venetians, and you’ll quickly appreciate the luxury of discovering art and architecture undisturbed, not to mention sensing the spirit and beauty of La Serenissima’s elegant traditions. Christmas in Venice comes down to four main headings: concerts, crèches, consumerism, and cuisine. A splendor of choice awaits the traveler prepared to plan ahead, bundle up and improvise at the last minute. The season begins on December 8, the Feast of the Immaculate Conception, a national holiday when many businesses close in observance. Expect everything to be chiuso on Christmas Day, December 25, the most important religious holiday of the year, as Venetians celebrate at Saint Mark's Basilica. A huge audience fills the Byzantine landmark for midnight mass, its great doors thrown open, a combination of bracing air, haunting melodies, a thousand candles reflecting gold-tiled mosaics, swirling incense, crimson accents and ringing bells, set on a background of the moonlit square. The following morning, December 26, the feast of Santo Stefano occurs. Families venture out on this public holiday to view nativity scenes in churches and visit Christmas markets. The Frari in San Polo, one of the oldest churches in Venice, offers a free concert at about 4:00 PM. There’s no central clearing house publicizing the multitude of concerts in Venice during the season. Experienced travelers recommend that on arrival you study the bills and large posters all over the city which advertise Christmas concerts held most evenings in the city's vast basilicas. Remember that the basilicas aren't well-heated, and the seats are unpadded, so lap blankets and portable cushions may improve the experience. Venetians favor flannels and furs for these events. Small museums and churches schedule concerts – some free, some charging nominal admission, some allowing advance purchase, some with tickets available at the door. The recently restored Church of San Vitale in Campo San Stefano is home to a magnificent Carpaccio which hangs over the altar. La Pieta on Riva degli Schiavone is the place to hear Vivaldi, the composer’s own church where many of his works were first performed. Ca Rezzonico, Palazzo Moncenigo and the Scuola San Rocco also offer concerts. This year on 20th December, Luna Hotel Baglioni is holding a special Christmas Concert from 6.30 in the evening in its Sala Caminetto. The event is free of charge and will include both traditional Italian Christmas songs as well as melodies that will be familiar to people from all over the world. It is open both to guests and members of the public and may be followed by dinner in the hotel’s Canova restaurant (menu below under Dining). Christmas markets known as Mercatini di Natale pop up from mid-December until mid-January in the different campos and around the Rialto. 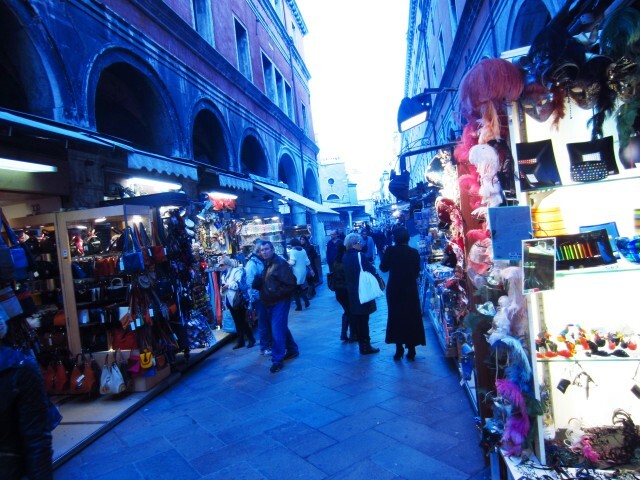 The largest market, in Campo Santo Stefano, is filled with stalls selling quality Venetian handicrafts. Some markets offer antiques, others foods from all over Italy. With little effort you will discover nativity objects, children's toys, purses of saffron velvet, hand-made stationery and marbled paper, Burano lace, irresistible baby clothes, hand-embroidered linen, subtly coloured grappa glasses from Murano, cocktail stirrers and bronze alligator wallets priced to devour a week's wages. Seasonal treats, libation, and music add to the pageantry of these markets. Fantasy lights, garlands and trees are present only in the busiest parts of the city: the Merceria, the Rialto, San Marco. But true Venetians seek out presepi, Christmas crèches typically displayed in churches and seasonal markets. Nativity scenes are essential to a Venetian Christmas experience, a fixture of every church, often lighted and animated. Elaborate displays figure at many Christmas markets, some showing ornate tableaux of villages which include tradesmen, home scenes and natural wonders arrayed around the stable, manger, Madonna and child. Every other year The Church of the Madalena in Cannaregio showcases a beautiful collection of nativity scenes featuring the works of local and international artists. In prior years The Scuola dei Carmini in Dorsoduro mounted a display of presepi which filled two rooms and ranged from simple scenes made from clay and wood to an enormously complex and delicate model formed in Murano glass. If you’re lucky enough, you may catch sight of a huge straw nativity scene on a gondola cruising down the canal on its way to the Rialto. At home, Venetian Christmas Eve tables abound with traditional seafood recipes: Risotto de Pevarasse (Venetian clams risotto); Branzino al forno (oven-cooked Seabass); Anguilla (Eel); mixed fried fish garlanded with grilled or stewed vegetables; Capeeti or Ravioli in Brodo di Cappone (Ravioli in Capon broth); Cappone lesso (boiled Capon); Musetto (boiled salame). Seasonal sweets like slices of candied orange coated in bitter chocolate are a local favourite, as are glazed chestnuts the size of plums (and priced at over €1 each). Panettone or pandoro with a dollop of Mascarpone round out traditional meals. These are the specialties to look for on restaurant menus. The challenge is how to sample seasonal dishes outside private homes. Many restaurants close from Christmas Eve until mid-January or from New Year's (San Silvestro) until late January. Some may stay shuttered until Carnevale (February 22- March 4, 2014). In Venice, you are best served to plan your Christmas dinner location weeks ahead, book early, avoid the last-minute rush for scarce seats. This writer’s preferred option for a holiday feast would include a visit to the Canova restaurant where Chef Cosimo has put together an enticing 4-course Christmas menu featuring prawn salad, homemade ravioli, Roquefort fondue, lamb medallions and signature frozen nougat dessert. A midnight walk after Christmas dinner has got to be part of your game plan. All the ghosts and spirits will be out, drifting in the mist, peeking through the shadows, whispering along the lanes. Stop for a moment on a secluded bridge, look around, take a moment to listen to the lapping of waves against the ancient bricks. This is the unforgettable Venezia not everyone knows, the stuff of fiction, the realm of fantasy, uniquely yours forever. December 23-26th most restaurants are closed. Average December temperatures High 7C (45F), Low 1C (34F), chance of rain 30%. Warm attire is essential. The Festival of Lights comes early this year, November 27- December 4th, 2013. Hanukkah in Venice is celebrated in the Ghetto, in the Cannaregio Sestiere, the first segregated Jewish community in Europe. Visit the Campo di Ghetto Nuovo, for the lighting of the Venice Public Chanukah Menorah. In the quarter you can locate kosher food finds, like Frittole di Zucca Barucca. Pumpkin, which arrived in Italy after the discovery of the Americas, proved so popular with Northern Italian Jews that in Venice it’s called "Zucca Barucca" ("Holy Pumpkin," from the Hebrew "Baruch," "blessed"). It is a delicious fried treat prepared especially for Hanukkah. Venice Ghetto Glass has several interesting Murano glass gift items: the traditional menorah candelabrum, and a range of glass shofars ranging in price from €29-250. Concierge tip: Planning to spend an unforgettable VIP Christmas in Venice? Then look no further than the special Christmas at Luna Hotel Baglioni package. Giuseppe di Martino produces one of the best pastas in the world, strictly produced in Gragnano close to Naples. He will guide us along the marvelous flavours of the Partenopean city on a very special occasion: Christmas ! First part.